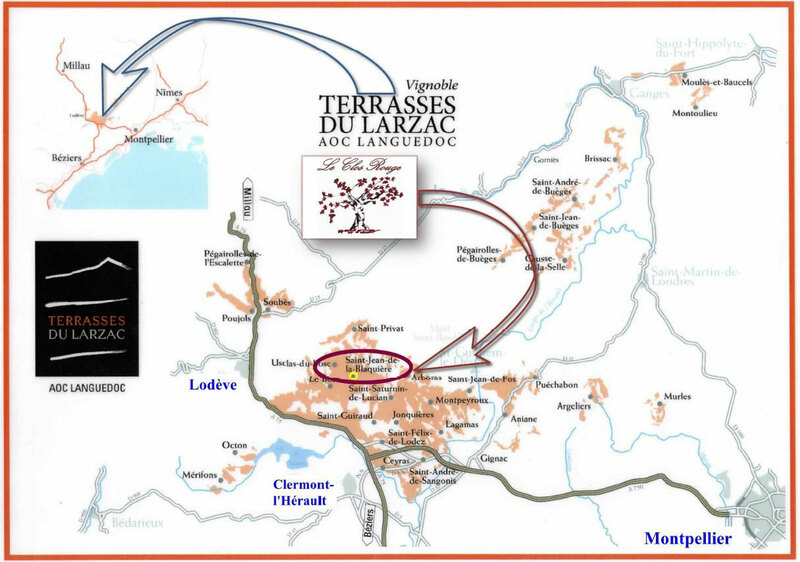 Le Clos Rouge is located in Appellation of Controlled Origin “Terrasses du Larzac” on the commune of Saint-Jean-of-the-Blaquière. From 2 hectares in 2013, the field extends since the end of 2017 on 8 hectares by the addition from new pieces from Cinsault, Carignan, Grenache and Syrah. Without being still labeled “Organic”, we took the steps of certification in 2015. In the meantime work in the vine continues to be done without plant health inputs resulting from industry, with a mechanical and manual weeding. The use of liquid manures and decoctions (nettle, horsetail, fern and consound) being systematically associated with copper and sulphur pulverizations. All the harvest is done in boxes from 10 to 20 kg. The grape is picked off. The encuvage is made manually. Out of tank aeration and pigeages are reasoned according to tasting to avoid on-extractions. We use a hydraulic vertical press which enables us to control to the maximum the extractions. Our objective is to produce flexible wines, on the smoothness and freshness with the image of this particular soil characterized by the proximity of causses of Larzac.